I wanted to let you all know that we've teamed up with Wrestle Crate to bring their service to the UK and Europe, without needing to pay such high shipping and import fees. I don't want to give you a sales pitch or bore you with all of the details from the press release. I also appreciate that a mystery box of wrestling loot isn't going to be something that everybody wants to spend their money on, but if you do find yourself buying wrestling tees, DVDs, autographs, figures and other collectables each month then this might be something you'd dig. The purpose of this post is to simply let you know what it is, why we're doing it and answer any questions that anybody may have. First of all, please don't think that this is some bunch of chancers trying to jump on a bandwagon and make a quick few quid. Wrestle Crate are the original wrestling-themed-box service. This is an established product which has proven to be massively popular in the States. All that we are doing here is making it more readily available to wrestling fans in the UK and Europe, since we often have to pay a fortune to have stuff shipped from the States. Our lower shipping costs will save you as much as £8.75 per month. Our other mission is to get more UK-based content into the crates - both here and the US-based crates. With that in mind, our crates will be largely identical to our US counterparts each month as we are providing the same service. There will be slight differences between the two on occasion, however we will only do this if the cost of importing a certain product would hit the pocket of our customers or if a product wouldn't work in Europe, such as region 1 DVDs for example. Better yet - as an exclusive bonus for the UKFF faithful, if you enter the promo code UKFF10 at the checkout you'll get 10% off your first crate. This offer is valid until 31/12/15. Our first crate ships on Nov 18th and you can sign up for this until Nov 13th. I've posted some further details below if you'd like to read them. If you have any questions, please just give me a shout. Wrestle Crate is the world's first mystery crate containing pro wrestling goodies. It's a subscription service, meaning you buy and receive a crate each month. You can cancel at any time; there is no 6-month obligation to get the best deals. You can re-activate and cancel your account as much as you like to opt in and out of months. WHAT IS INSIDE A WRESTLE CRATE? WHAT IS THE DIFFERENCE BETWEEN THE STANDARD AND ULTIMATE CRATE? Simply the amount of stuff that you get inside. The Ultimate Crate features everything that the Standard Crate does and then some! Our new dedicated European website is www.WrestleCrate.co.uk where you can sign up today. This will ensure that you'll be first in line to get our first crate shipped from the UK on November 18th. Be it a treat for yourself or even Christmas gift - this is a must for any pro wrestling fan. If t shirts are included, can size be specified before dispatch? Absolutely. When you order, once you've picked your Crate type you're asked to select your shirt size. If you have any other questions, please just give me a shout. Thank you for checking it out man. Thank you for coming to check out our US counterpart. You're right, it's totally a lottery in the sense of the mystery element. For me personally, the charm lies in the unknown element. The originators of Wrestle Crate strive to deliver both a diverse mix as well good quality content in each box, always ensuring that it's contents value is significantly more than the price of the Crate. We will continue with that ethos but one of our aims is to have our own influence over what goes into the Crates each month. With that in mind, I encourage feedback and suggestions of content you'd like to see more or less of. Do the cost of the items in the box individually work out more than the cost of the crate? The retail price of the Crate's contents does, absolutely. We buy enough to bring the total cost down but if you went and bought the contents of the Crate from Amazon, wrestling promotion's websites, etc you'd definitely pay a lot more. I'm actually just putting the finishing touches on the first UK-based Crate's content today and I've estimated the RRP of the Standard Crate at £28-£32 and the Ultimate Crate at £54-£59 if you bought one of each item separately. The £5 discrepancy is due to one particular item being a Wrestle Crate exclusive, therefore with no definitive RRP, so I've looked at what companies selling similar things charge. I hope that this helps. There is three more days to sign up for the November Crate. My Wrestlecrate arrived Saturday morning and I'm very happy with the goodies I received. Daniel Bryan Pop Funko. As a collector I did worry when I saw the box initially but was chuffed when I realised it was a variant. PCW Who Dares Wins DVD. Card looks pretty cool, a lot of names I'm familiar with and I haven't watched any PCW in a while. Vertigo Pro Wrestling Chapter 2 Fight DVD. Admittedly haven't heard of the promotion but again a decent looking card. Stone Cold Something Print. Big fan of these prints we get occasionally from Calling Spots. 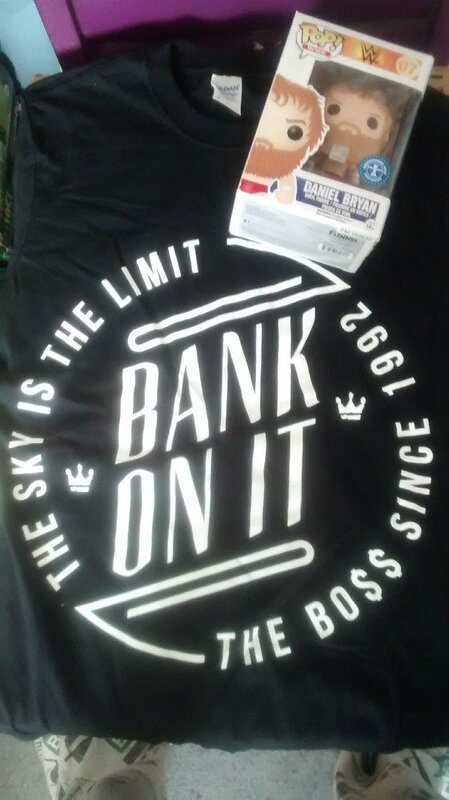 Sasha Banks shirt. This I was very pleased with, very rarely wear wrestling shirts and feared this to be a Calling Spots shirt (which I do own), as Im in love with Sasha this is great, not an obvious wrestling shirt either. Be interesting to know where shirt came from because I don't think it's an official WWE one. Thank you very much for taking time to write up your thoughts on the first UK-based Wrestle Crate. We really appreciate the kind words and the support, both of our new venture and of the magazine. As a fan of the magazine, you may be interested in a Wrestle Crate exclusive in a Crate very shortly. Regarding the rebill date on the 23rd - if you ever want us to push that back a week to save you the hassle just drop us a line at info@wrestlecrate.co.uk and I'll happily sort that out for you. Looked at the price of the 2 dvds which I think together is £21 inc postage, so may be worth trying a box for £25. If I got a t shirt I did not like then I would just give it to a friend. I would be interested if Japanese and Mexican shirts/ autographs and dvds will ever be included. Brit indys would be quite interesting, there is some good talent out at the moment. However not sure what I would do with toys. Only really collect prints that are signed personally but I would still enjoy them. Yeah, although it isn't the be all and end all, we do aim to get great value into the Crates. There was at least £55 RRP of content in this month's Crate, including some items that were either 100% exclusive (The Boss shirt, artwork) or limited edition variants of a product (Funko) which are more difficult to find. I'm not sure how much this counts as Mexican, as he made his name in the US, but our American counterparts (before we joined the team) had Chavo Guerrero Lucha Underground merch in a recent Crate. Throughout 2016 I personally intend to have as many countries represented in both the UK and US based Crates as I can. Toys and collectibles are polarising, to use a WWE cliche. Personally, I'm not much of a collector. But I know a LOT of people who are. The beauty of the Crate is the mix. I love that people haven't loved one item and been "meh" on the rest. Lots of people have loved lots of different items. Oh and all of the autographs are of course hand-signed and we purchase directly from the talent, not third party autograph distros. When I hand-pick and subsequently buy stock I want to put money into the pockets of wrestlers, good wrestling promoters and trustworthy creative people (artists and suchlike). If you ever have any questions just hit us up here or on Twitter @@WrestleCrateUK and I'll be happy to help. I might have been interested, but I don't buy autographed merchandise, only merchandise that I get autographed myself due to there being so much fake autographed stuff out there. I am in no way saying you do this, but if I don't personally get the autographs myself, in my mind they may well be fake and I won't buy any product containing them. I know far too many people who have been ripped of by very good fakes. Good feedback, and great to hear another opinion like this as I too am often dubious too so it's good to hear that I am not alone in that. For what it's worth, we generally only deal with the wrestlers directly. Partly because we want to give back to the people who sacrifice their bodies for a market that we are now trading in but also so that WE can trust that they are legitimate. The only exception to this is when we go through somebody's manager or suchlike. As a rule we never ever deal with autograph traders or online merchants selling autographs. We go to the source. Although it is perhaps the worst evidence of all time, if you hit me up on Facebook or Twitter I'll happy send you the photo that Reby Sky sent us while Matt Hardy was signing the promo photos for us. I have never posted this online (as it's a pretty boring photo of the back of Matt's head) so I can't dump the URL in here but happy to share. It may also be worth noting that not every Crate will feature an autograph. Next month's Standard Crate currently (and things do change quickly) looks like it will not have an autograph inside. I can't say the same for the Ultimate Crate though. As I say, thank you for the constructive feedback and for the best wishes. Just give me a shout if you do have any questions. Just to add to Krytie's awesome post from a few days back, here is a photo of the first UK-based Ultimate Crate in it's entirety. Although now sold out, we do have some stock left of a few items which we are giving away in a Facebook competition. If you'd like to enter, and to keep abreast of news and stuff, you can find the competition here. So it will be more UK based stuff? Not my cup of tea to be honest, no offence.